Today we’re breaking out the spoons and digging into a jar of Chocolate Coconut Chia Pudding. Of course, you could enjoy this delightful Chocolate Coconut Chia Pudding for breakfast, too. I’ll leave that up to you. But first things first, I’d like to talk about a little thing called motivation. Do you lack motivation? Or are you a go-getter? Are you someone who is easily motivated and who does not procrastinate? I fall into the category of “lacks motivation”. I’m a procrastinator. Often, I do not feel motivated enough to begin projects. Of course, I do have moments where I’m bursting with motivation. Whenever I have something to work on that is of interest to me, such as cooking or planning a vacation, I’m bursting with motivation. However, sometimes I even lack motivation when it comes to doing something I enjoy. Sometimes I do not want to cook or create recipes for the blog. I procrastinate stepping into my kitchen. I procrastinate opening my refrigerator or pantry to gather ingredients. However, since this is an activity that I enjoy doing, I am usually able to muster up enough motivation to outweigh the procrastination. Another area I lack motivation in is exercise. Sometimes I’m able to easily motivate myself to exercise after work. Sometimes I moan, groan and make excuses as to why I can’t exercise. Why do I do this? I’m not really sure. I enjoy going for walks and short jogs. It gives me time to think and clear my mind. I feel great after going for a walk or jog. Yet I still find myself saying I don’t have time to do it. I still find myself looking for clouds in the sky so I can tell myself that it’s going to rain, no exercise today. I believe lack of motivation can be overcome with willpower and determination. Go into something with a positive attitude; tell yourself you can do it. Tell yourself that if you begin now, rather than procrastinate, you will be done sooner, giving yourself more time to spend on other more enjoyable things. At first, it may be difficult to change your mindset, but with willpower and determination it can be done. Do you need another jar of this Chocolate Coconut Chia Pudding yet? That was lengthy commentary on motivation, wasn’t it? This chocolate coconut chia pudding is a simple dairy free dessert option. 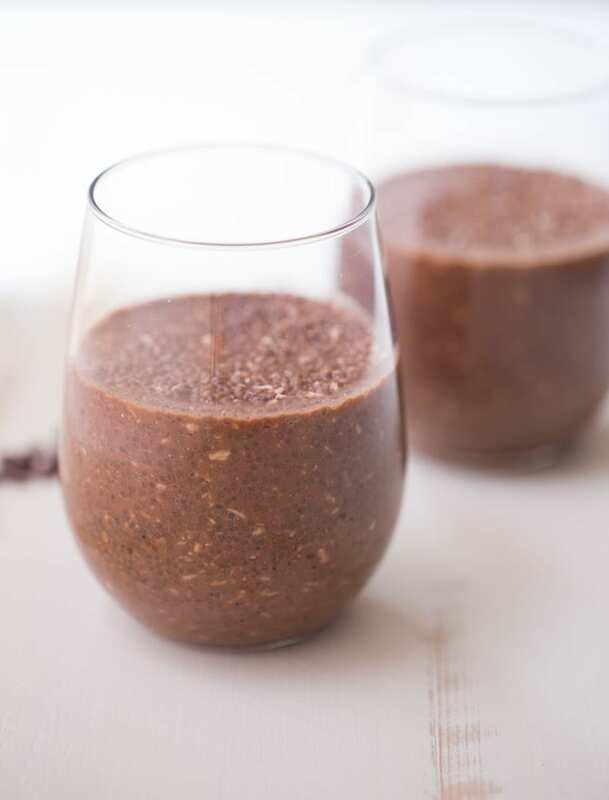 You could consider it a super foods dessert recipe since it’s ingredients include chia seeds and cacao, which are packed with nutrients and antioxidants. 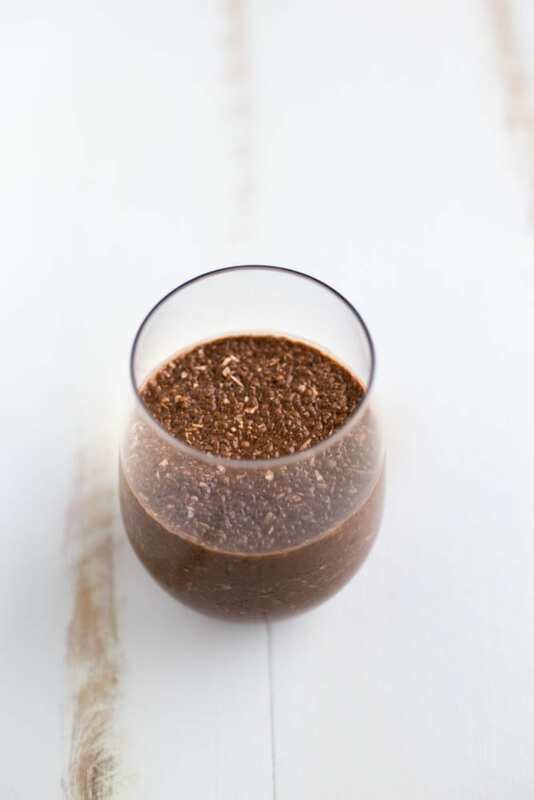 In addition to chia seeds and cacao, coconut milk, maple syrup and unsweetened shredded coconut are the only other ingredients you will need to make this Chocolate Coconut Chia Pudding. Did I mention that this pudding is EASY to make? It’s as simple as whisking together the coconut milk, chia seeds, cacao, shredded coconut and maple syrup. After that, pour the mixture into glasses, ramekins or small bowls and refrigerate for 2-3 hours or until set. Then the Chocolate Coconut Chia Pudding is ready to enjoy. 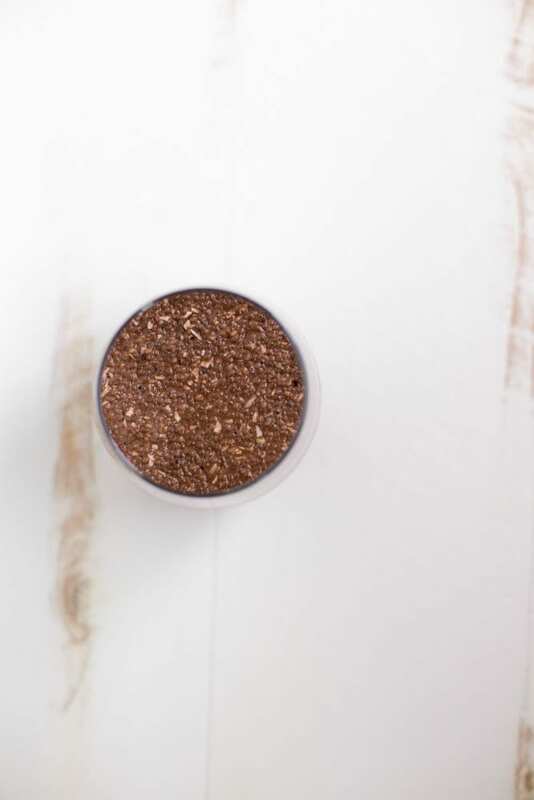 In a large mixing bowl, whisk together the coconut milk, chia seeds, cacao powder and shredded coconut. Then gradually add the maple syrup, tasting after each 1-2 tbsp to test the sweetness. I used 3 tbsp. Once your desired sweetness is reached, give the mixture one more whisk and then pour into glasses, ramekins or small bowls. Isn’t it weird and annoying how we start making excuses for no apparent reason? I do the same thing even though I truly love working out. Regardless, I love chia seed pudding and this one sounds fantastic! YES! Exactly, it is weird and annoying that we make excuses for no reason. I am a procrastinator too. If I can put something off until later, then I am going to find a way to do it. Apart from with workouts, I rather get them out of the way first things so I don’t skip it. Oh, and this is one of my favourite desserts. So comforting, but so easy to make too. I wish I could make myself get up early enough to work out before work. I did it for about a month but then I went on vacation and it didn’t happen again. That was almost a year ago! I need to motivate myself to start back up again, right? ;) Thank you for stopping by and sharing your thoughts, Dannii! Have a lovely weekend. Oieee, I struggle in the motivation department too and you are right, there are times when it comes in waves. But it’s so hard to get out of the gutter. Love how indulgent yet healthy this pudding is! Would you believe I have never tried chia seeds? I need to try this! It looks delicious and I love that it is a healthy dessert! And I can be a big procrastinator too…but for the most part I am motivated. I just put things off sometimes that I don’t want to do. Oh you need to try them, Michelle! I usually use them in smoothies but I’m glad I tried them in a pudding recipe! Love the super easy list of ingredients. This looks so decadent yet healthy!